Rinsing your vehicle after washing may seem an obvious step. There are however, products which will affect how easy it is to dry your car and help keep it free from water spot marks. Water spots – those annoying, difficult to remove, potentially damaging irritations which seem to appear in places you thought you’d thoroughly dried off. Water spots are left when water evaporates leaving behind mineral deposits – so cars should never be washed and rinsed in direct sunlight where the heat will cause water to evaporate more quickly. In rainwater the most prevalent of evaporates is precipitated calcium carbonate – also known as PCC. From rinse water there are likely to be other impurities, primarily calcium and magnesium, but possibly also sodium, copper and iron. De-ionised water filters offer a solution to water spot marks. 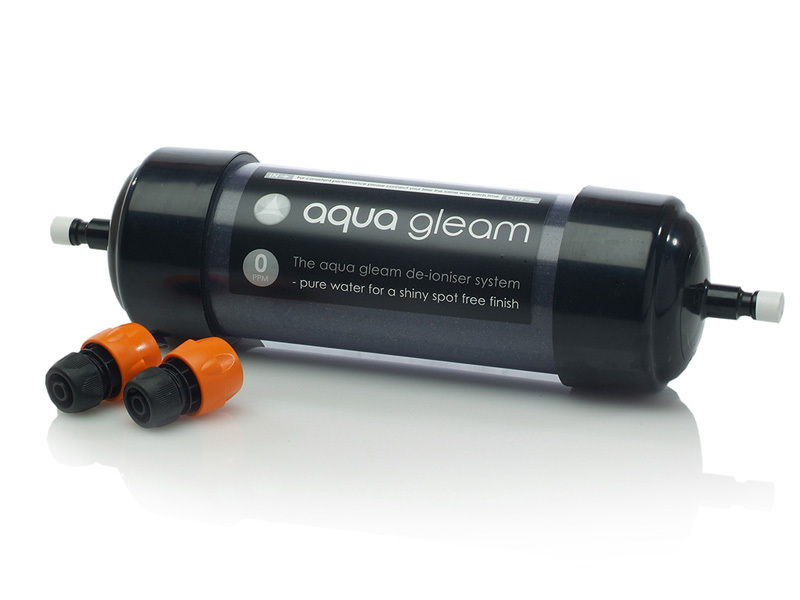 These innovative filters contain an electrically charged resin which neutralises impurities in the water through ion exchange. De-ionising water filters usually state their purification capabilities in terms of parts per million (ppm), for example neutralising ions in the water to produce de-ionised water to 30ppm or 0ppm . If you have a black car it will show up water marks far more than a lighter coloured car so you may wish to opt for the highest level of filtration available (0ppm). With the impurities in the water largely neutralised, it is usually possible to allow the car to air dry, rather than having to use a drying towel. This time and energy saving benefit is usually the deciding factor for those considering whether or not to purchase a de-ionising water filter!